From its beginning - "with a body "ecstatic in the swirling/ rhythm of itself" - "to its rhythmic closing - ""the slow echo of stone chipping stone" - "RIVERFALL is a collection of poetry filled with the real and imagined geography within and around us. The first section, A Body of Water, spans the Western hemisphere, from the trickle of a mountain stream to a series of eloquent letters by Charles Darwin to his sister, circa 1832. On the Orchard's Edge explores the brambly places at the edges of fields and mangrove swamps and startling memories. The book closes with The Last Harvest, a selection of beautiful, mythical, and often haunting reflections on place, and the places we can no longer attain. Altogether, Riverfall possesses you like the archaeologist in "The Bone," where you'll find yourself "flowering/down while my blood runs to the river." Simmons B. Buntin is the founding editor of Terrain.org: A Journal of the Built & Natural Environments, an award winning international journal at terrain.org. His own American terrain has varied from the rolling hardwood hills of Maryland to the flagstone trails of the Colorado Front Range, the scrub oak hammocks of Central Florida to the thorny scarps of the Sonoran desert, where he lives today in Tucson, Arizona. His passions include sustainable urban design, hiking, photography, and his wife and two daughters. His poetry has appeared in numerous North American journals and anthologies, and he is a recipient of the Colorado Artists Fellowship for Poetry. but a major one for myself. (where last I have seen either you or Susan). How can I explain my misery at that time? as my stomach did the same. knew no friendship for me. a clod of saturated grass, still living - all signals. such as in these tropical lands. hundreds of insects, small mammals, and birds. with scarlet, violet, and even silver. How much it reminds me of your favorite brooch. of lizard-catching now, as well. for all - it is my passion, no man sees harm. the tropical canopy is secure in the mist. In "The Best Time for Reading Poetry," early in Simmons B. Buntin's first book, Riverfall, the author makes the deft and risky move of identifying his primary poetic forebears: Mary Oliver, James Galvin and A.R. Ammons. The move is risky in that it invites comparison with three formidable poets working in a mode similar to Buntin's, but it succeeds by ingenuously aligning his work with theirs while forestalling any criticism about its derivation. In fact, many of the best poems in Riverftll are those that most audibly echo the voice of another poet. Ammons in particular is a rich vein for Buntin to mine; the bare, existential "I," bereft of history or context, becomes a powerful tool in Buntin's constant interrogation of the engagement between the human and the natural world. Like Ammons, Buntin expresses the Romantic urge for an ecstatic union with nature, while acknowledging that such a vision must necessarily be informed, and perhaps even curtailed, by the exactitudes of science and the cynicism of modern life. The end result is a poetry that never shies away from hard particulars while still managing to affirm the position of human beings in the natural order. This precarious balance between humans and the natural world is most strikingly addressed in the first poem of the book, "Body of Water." 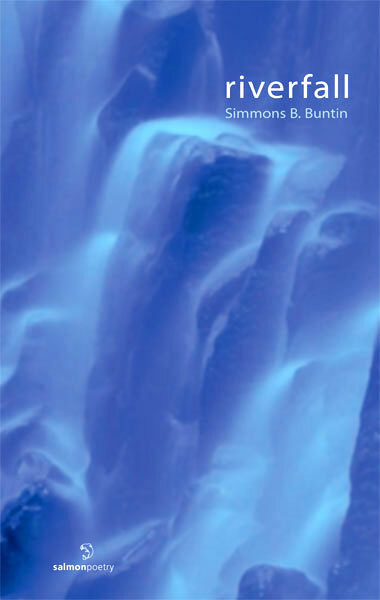 Buntin explores the double-meaning inherent in the title, systematically using simile to compare natural botlies of water with his own embodiments - "mind," "soul" and "breath:"
Buntin's simile is important here because it compares human attributes with natural ones while resisting the outright equivalence of metaphor; in asserting that his mind is "like a riverfall," the speaker also forcefully emphasizes that his mind and the riverfall are fundamentally separate. This separation takes on an ethical dimension at the poem's close. The objects of the speaker's address are revealed to be the bodies of water themselves, for which he has two words: "I apologize." The occasion of this apology seems cryptic at first, as the poem indicates no overt wrongdoing. The source of the apology must therefore be the act of comparison itself, which attempts to invest the natural world with human characteristics ("ecstatic in the swirling") even as it models human characteristics on the natural world. Humans are cursed with the knowledge of their fundamental and insurmountable isolation, but this knowledge engenders an ethical view of the universe denied to the rest of nature. reminds me she is queen only of marsh. By the end of the poem, however, the speaker again overcomes the divide between the human and the animal world, this time by speaking with the voice of a fellow heron: "And I step toward her, / lifting my reed-thin legs." The culmination of the union between bird and human occurs as an act of language: "in the low cry that stills the air, / we vanish." With a single word, "we," Buntin effortlessly achieves what is impossible outside of the poem. The union is a tenuous one - it "vanishes" with the poem's close - yet it exists fully in the poem's imagination. Throughout Riverfall, Buntin employs a hard, authoritative diction to great effect. Objects, animals and plants are all called by their most specific names: 'Johnboats," "amberjack," "bromeliads" (to pull a few from a single poem). The cumulative effect of this diction is to create a sharply delineated world that demands to be read as primarily realistic rather than symbolic. vVorking as a counterpoint to this diction is the language of the ecstatic, as in the poem "Coyote:" "I can / follow her sweet desert song / like a stream through the fiery hills." In the most successful poems, these two dictions balance each other; flights of fancy are tethered to earth by the solid nouns. Occasionally, the romanticized diction overwhelms the other vocabulary. In these poems, the will to transcend feels somewhat forced, which is the great risk of ecstatic poetry. Elemental poetry. Nature poetry. Water poetry. Whatever you want to call it, Simmons Buntin wants to make sure you don't finish his debut, Riverfall, feeling the slightest bit thirsty. Or dry. It's not the safest approach, singing an epic song of oneself right off the bat. It requires dodging a minefield of cliches and invites unfair comparisons to Walt Whitman. But Buntin is smart enough to avoid channeling nature's vast power and instead celebrates his vulnerability, his silence in the face of "the constant call / of lunar pull." In the end, he is as susceptible to the moon as any body of water, hence the poem's title. Riverfall isn't just about experiencing nature; it's also about the literary and aesthetic pleasures nature inspires. In "The Best Time for Reading Poetry," the speaker bonds with the environment on board--of all places--a jet plane. After dining on airline peanuts and reading an Audubon essay, his "mind is left meandering like a stream / in Hemingway's Michigan." He thinks about bat sonar and cricket cacophony before drifting into the poetry of Mary Oliver and A.R. Ammons. With playful irony, Buntin observes that his flight of fancy only ends when "the plane touches solid ground." and because she is egress, the exit he deserves. The only uncertain moment in Riverfall takes place at the end of the list poem "Thieving," in which the speaker credits all of God's foliage and fauna with various traits. For example: "From the mole vigilance." But when the poem ends with the line "From the human theft," I nod my head in agreement, but not in astonishment. After all, the final statement is a realization most sensitive readers of verse came to early on. Ultimately, the poem fails to transport me. Still, putting aside this quibble, Buntin offers the reader plenty of opportunities to re-imagine and reflect on nature in new and different ways. From the epistolary vision of Charles Darwin writing his sister from on board The Beagle as he tours the Galapagos Islands to the William Carlos Williams tribute of "Great American Chicken," Riverfall overflows with rich language and mythical imagery. Pick it up, and be prepared to be swept away.